Resistant to harsh weather, from hurricanes to heavy rains and snowstorms, cedar wood roofs provide a beautiful cap to a home. They are energy efficient and provide better natural insulation over their flat and common asphalt counterparts. Premade ridge caps are readily available on the market. They are also easy and inexpensive to make on your own using remnants of the shingles you used on the roof. The roof has a deck, usually made of ½-inch plywood, that makes the foundation and the structure of the roof. This is also the nailbed where the shingles will be applied. The roof edge is created by the edge of the shingles or eaves. The attic under the roof structure provides ventilation that protects the roofing from expanding because of too much heat in the summer, as well as releasing moist air in the winter that gathers from the heat that collects inside the house and rises. Vents in the roof structure allow the attic to be effective in its ventilation. The saddle is the areas around chimneys or other roof protrusions that keeps water from getting inside the roof or house. The horizontal line at the top of the roof is called the ridge and the valley is the angle that runs along the junction of a roof with two slopes. An underlay membrane made of synthetic fabric or a saturated felt protects the shingles from the decking. 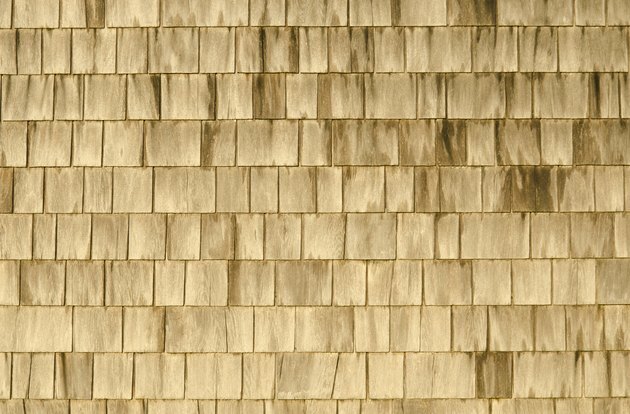 Shingles offer character and a final layer of protection. The best time to replace a roof is during the warm spring and summer months. The heat from the sun assists the shingles in bonding together rather than shrinking from the effects of cold weather. Adhesives prefer warm weather, as well, although roof repairs can be done all year long with weather considerations. Any time of year, make sure you have a steady ladder and secure place to install shingles or ridge caps when working on a roof. Gloves and protective eyewear are also highly recommended for keeping injuries to a minimum when working on a roof. A cedar shake roof ridge cap isn't difficult to create. Once all the shingles are nailed to the roof decking, construct the cedar shingles. Line the entire roof peak with a good adhesive membrane that the roof caps will adhere to. Make sure all shingles on each side are covered. Lay down a layer of shingles with a second layer over the top until the shingles meet at a single, straight peak. Cover all of the nail heads with roofing cement. Cover the length of the cedar shingle roof peak that the new layers of shingles have made. This creates a waterproof seal over this rough roof peak.